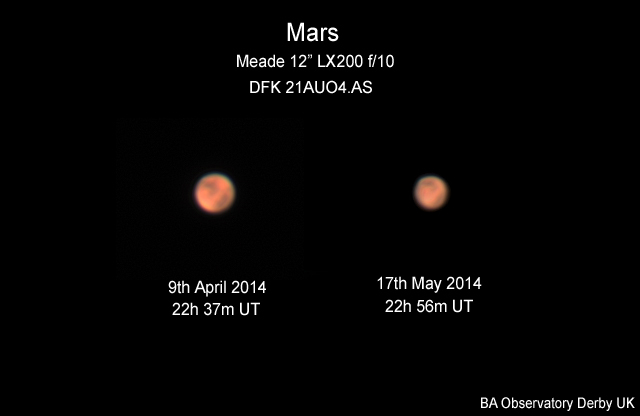 The following sequence of four images show the change in the apparent size and face presented by Mars from the 18th April to the 18th May 2014. They were taken by Peter Hill using a Celestron NexImage 5 camera and a 2x Barlow through a 200mm Skywatcher F5 Newtonian on an HEQ5 Pro mount at 1000 frames per second. The images were stacked and processed using wavelets in Registax 6. A NASA map of Mars is shown for comparison - can you identify some of the surface features? 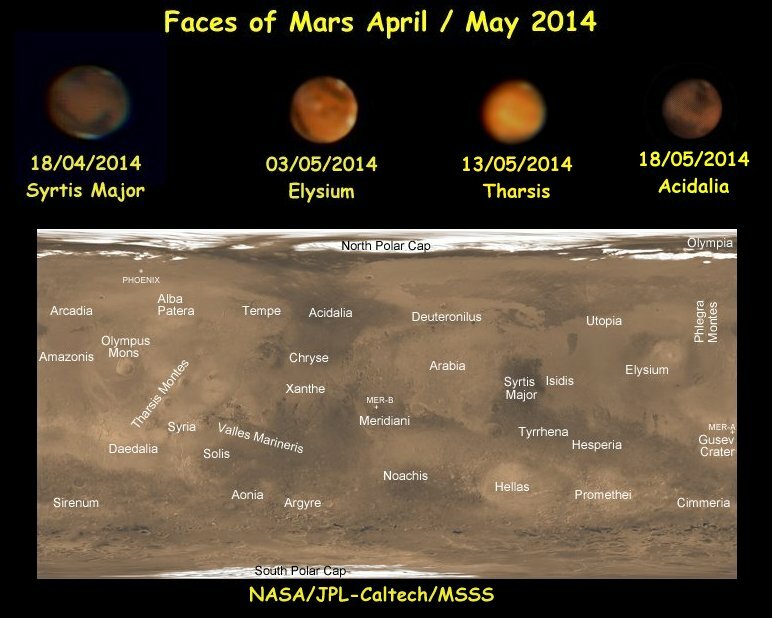 Peter Hill captured the following two images of Mars in the spring of 2014. The top image was taken at 00:02:18 BST on the 3rd May 2014 and is centred on the Elysium Region. The white spot at the centre of the image is most likely cloud over Elysium Mons. The bottom image was taken at 23:55:55 BST on the 18th April 2014 and is centred on Syrtis Major. Some major cloud cover over the Hellas Basin is visible at the lower limb of the planet. The north polar cap is at the top in both images. They were taken using a Celestron NexImage 5 camera and a 2x Barlow through a 200mm Skywatcher F5 Newtonian at 1000 frames per second, stacked and processed using wavelets in Registax 6. Tony Barker took the following image of Mars on the 18th April 2014. He used an Imaging Source DBK 21au618 one shot colour planetary camera with a TeleVue Powermate 5x barlow through a Sky Watcher Skyliner 250PX GOTO Dobsonian telescope. The camera was set at 60 fps, exposure at 1/60th sec, gain at 582, gamma at 100, and brightness at 63. 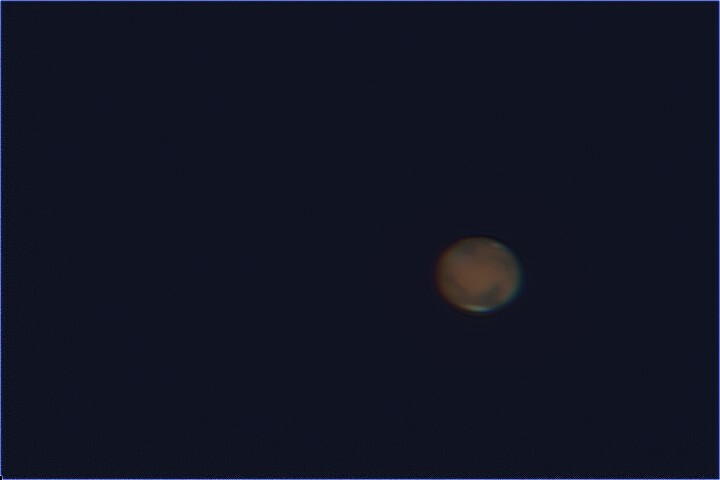 Barry Ashforth captured the following images of Mars on the 9th April and 17th May 2014.